Blog Pause Day Five: The beauty of revisiting this post is that all of the "about-to-be-born" babies I mention in the first paragraph have arrived. And since time just keeps passing, I'll note that some of them already are crawling. I'm surrounded by pregnancy and babies. Two of my friends, one local and one distant, likely are rocking or nursing their newborns as I type this post. Seven additional women I know are pregnant, all of whom are due in the next few months. New chicks are hatching. Last night I delivered a meal to my local friend. As I carried the plates into her kitchen, I nearly sucked in my breath when I saw her ten-day-old daughter sleeping in the baby seat stationed on the floor. Do they really come that small? My three girls were in tow, following me like ducklings, all capable of walking and eating and jumping and climbing and talking and doing so many other things that this precious baby was not capable of doing. Where did the baby stages go? Whenever I nuzzle my face into my youngest daughter's curls, I still breathe in her scent as if she were a baby. Whenever I see her still-pudgy feet, I remember how I kissed and tickled and marveled at her newborn toes. My children aren't babies any longer. At least, not when you compare them to a newborn. Before we left, my friend asked if I wanted to hold her daughter. I accepted immediately. She gingerly placed her in my arms and memories flooded back: the silky hair, the squeaky noises, the wide-mouthed yawns, the one-eye-opened and one-eye-shut unfocused glance around the room before drifting back into a scrunch-faced sleep. I look back at the pictures of my last pregnancy, knowing that I'm finished with this stage of life. I study myself, knowing now that the photos captured me mere days before labor. Alternatively, I remember the time as if it were yesterday and wonder whether it was me at all. I regard the images with contradictory closeness and distance, stepping along to an elusive dance of time and memory. These women I know, all of them, are living their lives in step with their music: the rhythms of baby showers and baby kicks, the choruses of sleepy newborns and nighttime feedings. If I glance back too much at my earlier stanzas and steps, I start to lose focus on my current dance. Our own routines seem so familiar to us as we live them. Nothing seems inherently magical about a typical day with my girls when I'm in the midst of it. Reese gets ready for school. Brooke curls on the couch with me to read books while Kerrington takes her afternoon nap. I clean up toys, prepare lunch, cook dinner, wipe up spills, sweep the floor, empty the trash, fold the laundry, check the homework, help with baths, say prayers, kiss goodnight, and then come downstairs for the quiet night hours, tired. It's a typical day in a house with kids who are almost-seven, almost-four, and almost-two. But, from experience, I know that I'll eventually look back at pictures from one of these typical current days, and I'll wonder how it's possible that the moment feels simultaneously like yesterday and forever ago. I'll remember the magic: how Reese dashed off the school bus and flashed a smile with a new gap where her loose tooth used to be, how Brooke rested her head on my shoulder as we read the same book again and again, and how Kerrington reached out her arms and sang Mama! when I entered her room after her nap. The one thing that's constant is time. It passes equally for each of us. No matter how hard we may try, we can't stretch it out or hurry it along. What we can do is embrace it, no matter how it's currently passing. Lord, I want to enjoy these days. All of these days. Enjoy this post? 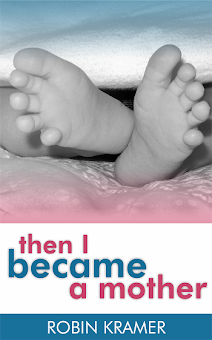 Read more from Robin Kramer's book, Then I Became a Mother. Alexa, thanks so much for dropping by and for your kind comment! I can entirely relate to the "deliriously happy" while simultaneously sad contradiction of emotions. Glad that you stopped by! What a great post!!! I have two little boys. My youngest is 13 months, my oldest is 3 and I too look back at my pregnancy pictures and think two things, "girl you have no idea what you are in for", and the second thing is "I hope I cherished those night time kicks where I couldn't sleep, because that will never happen again. I think the best you can do is live in each moment and try hard not to take them for granted because life is fleeting and before you know it your toddler is off to college. Loved reading this! "Girl, you have no idea what you are in for...." Isn't that the truth!